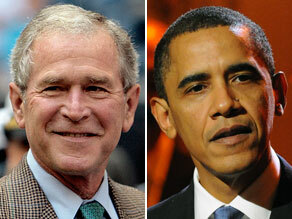 More Americans blame the Bush administration for the nation's economic troubles than the Obama administration, according to a new poll. (CNN) - More than a year after President George W. Bush left office, more Americans continue to blame his administration over any other entity for the nation's economic woes, according to a new poll. In a CNN/Opinion Research poll released last November, the public appeared split on who should be blamed if economic conditions don't approve: 47 percent said Bush and congressional Republicans while 45 percent said Obama and congressional Democrats. "The public still tends to blame the Republicans for current economic conditions," said CNN Polling Director Keating Holland. "But looking forward is another matter. Americans think the GOP is responsible for getting us into this mess, but they think both parties are responsible for getting us out of it." The poll, conducted February 5-10, interviewed 1,084 Americans and carries a sampling error of plus or minus 3 percentage points. Why are CNN polls always so skewed for Obama? The sample responses must all be from Democrats. If Bush was so bad, how did he get elected to a second term? If Gore was so great (and the Clinton years so wonderful), why was the election in 2000 so close before "Bush" stole it? If the economy is still Bush's fault and the Republicans, why is there a GOP Governor now in VA, NJ and a GOP Senator in Massachusetts? When the Republicans win in the Fall elections, are you going to blame Bush then? Who are the idiot 7%-ers who think it's Obama's fault? They must be new to planet Earth. Would we really expect any other report from a liberal CNN. Always trying to manipulate all the weak-minded. You cannot spend your way out of debt. Now Obama wants to talk about a spending-freeze, well it's about 13 months too late. How's that CHANGE working out. Well this is interesting... for an administration that wanted nothing to do with Bush, look nothing like the Bush Administration Obama is doing everything in his power to be nothing more than being the same. He was going to get the troops out of Iraq and Afganistan. He increased them into Afganistan. He held a Super majority in congress, guess what? He spent billions and trillions in budget (record breaking amounts) and has done what? NOTHING!! And for an administration who wants nothing to do with the Bush Name, they sure use it enough to make up for their shortfalls. Bush is the number 1 excuse for the Obama administration. Every time something doesn’t get done I BLAME the GOP, since when did we have to 60 votes down the middle among party lines to get something done in Washington?... It doesn’t make since and since it can’t be explained by any other logic... I'll say that the GOP just can’t get a long with a black man on top of the HILL! So instead of support at the bottom and help build our country they will just act like little babies and cry to the dumbest angry people... CONSERVITIVES! ITS sad and The GOP should be ashamed of them selves!!! I blame Bush for giving into 'dirty' Harry and Nancy Peliesi when they took control of Congress in 2006...They went on a massive socialist welfare program and George just stood by and did nothing. Now we have a massive 'ego' that tells us bow down and trust me. "Obama's popularity dropped farther, faster than any President in history. " No president before Obama ever faced a national disaster such as what Bush left Obama. I believe anybody's popularity would have dropped quick if they had to face what Obama had to face. The article isn't about Obama's popularity; it's about a poll that suggests that Bush is still getting the blame, and rightly so. Is this sorta of like Biden taking credit for the turn around in Iraq? When is this administration and the left wing idiots out there going to realize that Obama is the President and it is time he started taking responsibility good or bad. Yeah right, and a 100 lbs. of flour makes a pretty big biscuit. Blame Bush for everything....then watch the Obama administration pat themselves on the back for the victory in Iraq. We'll see how cocky they are on November 3rd when they no longer control the House or the Senate. CNN has completely given up any premise of being a legitimate news organization. You are nothing more than a liberal mouth piece and the fact that Foxnews kicks your rear in viewership & web hits shows that most INTELLIGENT Americans feel the same way. Continue to blame Bush for the failings of Obama and you will go the way of Air America and all those liberal rags you like to quote from. Bush and the Rs are to blame for the shape the country is in now. What a shocker! The only ones who don't believe Bush is to blame are die hard right wingers. I just hope most people remember it in November. The last thing we need is more R chaos. Just goes to show you how stupid the Tea Baggers look..you can't hide the facts. They are becoming the laughing stock of comedy..LOL. These are just a few that I can think of off the top of my head. But there are people who actually believe all this crap. And if you can believe this, then you'll believe anything, even that Obama is a socio-fascist communist Muslim terrorist. Only 31 percent? What rock were the other 69% under in 2008? Bush set the mess up with 2 wars and unfunded mandates while cutting taxes for the wealthy and corporations. End of story. Yes, Bush and Chaney and the Republican are definitely responsible for getting the economy into this mess. Unfortunately they are oh so happy to keep us in this mess because they are so "principled". Dang Idiots!!! Dem congress since 2006......Bush tried to control freddie and fannie before that....funny how dems forcing banks to give loans to people who could not afford them is somehow bush's fault. Housing caused this, not bush. BO said he'd fix it, he hasn't. it's pretty simple. The stupidity of the average American is laughable. The blind partisanship in many of these comments is downright comical, and further reinforces my opening point. To think that the Bush administration had the power and influence to change the economic tide of the entire world is just as asinine as saying Obama has enough power or has had enough time to fix the situation. There were a multitude of factors involved, including forces at play before Bush even got into office (thank you, PaulMoATX for at least telling some of the story). Instead of soaking up the biased media's hyped point of view, get a dose of true reality and talk to your grandparents, or anyone else who was alive during the Great Depression. When a lack of food is stunting your child's growth, you live in a Hooverville shack, and tow your car with a horse because you can't afford gas, you can start saying we're in the worst situation ever. Hey Americans! Take some responsibility for once! We all got our selves here and we are the only ones who can get us out. We over spent on credit cards and mortgages. We need to start living within our means again. But we also need to start spending again, if consumer money isn't spent, money doesn't go into the economy. Thus, government has to step in to keep companies afloat! So if you want an end to big government put your money where your mouth is and spend money to improve our economy. The current blamer in chief has been blaming the wrong administration. He needs to go a bit further back, the real problems began with the embarrassing clinton administration.